An experiment was performed using Affymetrix® gene chips on the CD4 lymphocyte white blood cells of patients with and without a hereditary allergy (atopy) and possibly with asthma. The Asthma-Atopy microarray data set and analysis are discussed in Gibson and Wolfinger (2004): a one-way ANOVA model of the log2mas5 variable ( summary statistics) is fit against a classification variable trt describing different asthma-atopy combinations in the patients, and the least squares means of the trt variable are computed. The following statements adjust the p-values in the test data set by using the adaptive adjustments (ADAPTIVEHOLM, ADAPTIVEHOCHBERG, ADAPTIVEFDR, and PFDR), which require an estimate of the number of true null hypotheses ( ) or proportion of true null hypotheses ( ). This example illustrates some of the features and graphics for computing and evaluating these estimates. The NOPVALUE option is specified to suppress the display of the “p-Values” table. Output 61.6.1 lists the requested p-value adjustments, along with the selected value of the “Lambda” tuning parameter and the seed (specified with the SEED= option) used in the bootstrap method of estimating the number of true null hypotheses. The “Lambda Values” table lists the estimated number of true nulls for each value of , where you can see that the minimum MSE (0.002315) occurs at . 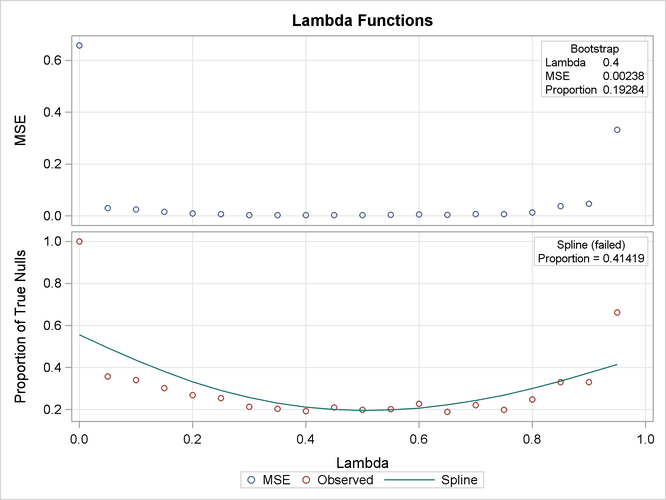 Output 61.6.2 shows that the SPLINE method failed due to a large slope at , so the bootstrap method is used and the MSE plot is displayed. Output 61.6.3 also shows that the bootstrap estimate is used for the PFDR adjustment. The other adjustments have different default methods for estimating the number of true nulls. 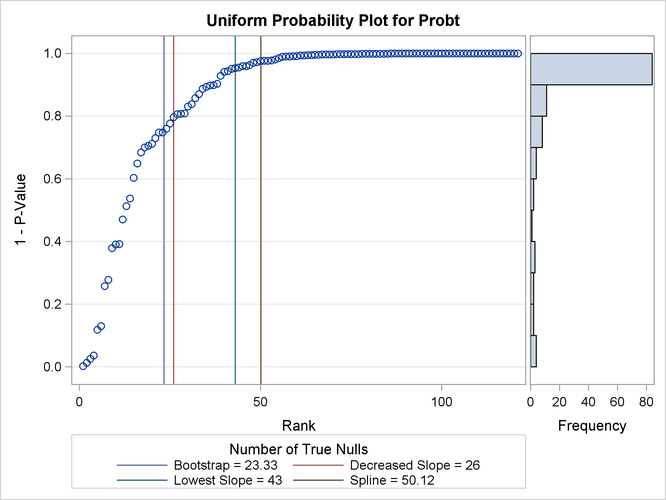 Output 61.6.4 displays the estimated number of true nulls against a uniform probability plot of the unadjusted p-values (if the p-values are distributed uniformly, the points on the plot will all lie on a straight line). According to Schweder and Spjøtvoll (1982) and Hochberg and Benjamini (1990), the points on the left side of the plot should be approximately linear with slope , so you can use this plot to evaluate whether your estimate of seems reasonable. A plot of the unadjusted and adjusted p-values for each test is also produced. Due to the large number of tests and adjustments, the plot is not very informative and is not displayed here. The top two plots in Output 61.6.5 show how the adjusted values compare with each other and the unadjusted p-values. 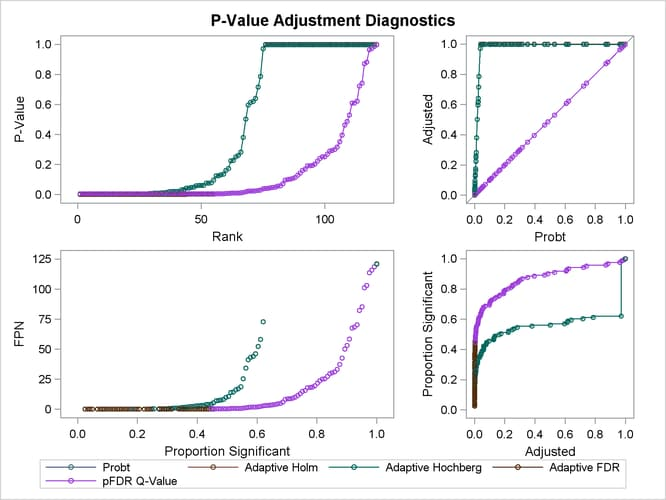 The PFDR and AFDR adjustments are eventually smaller than the unadjusted p-values since they control the false discovery rate. The adaptive Holm and Hochberg adjustments are almost identical, so the adaptive Holm values are mostly obscured in all four plots. 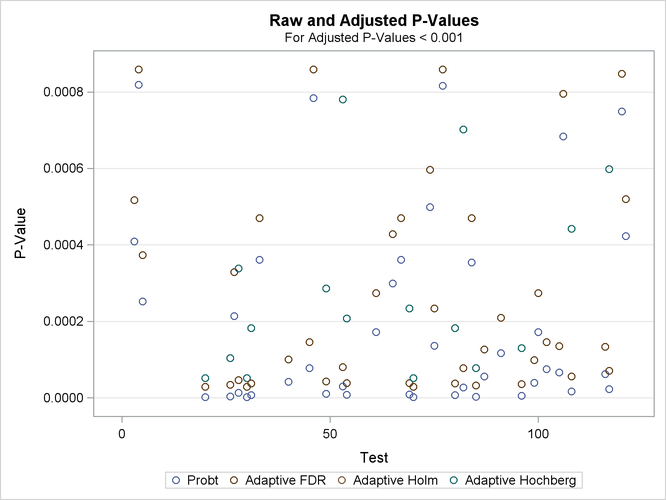 The plot of the Proportion Significant versus the Adjusted p-values tells you how many of the tests are significant for each cutoff, while the plot of the number of false positives (FPN) versus the Proportion Significant tells you how many false positives you can expect for that cutoff. A Manhattan plot displays –log of the adjusted p-values, so the most significant tests stand out at the top of the plot. The default plot is not displayed here. 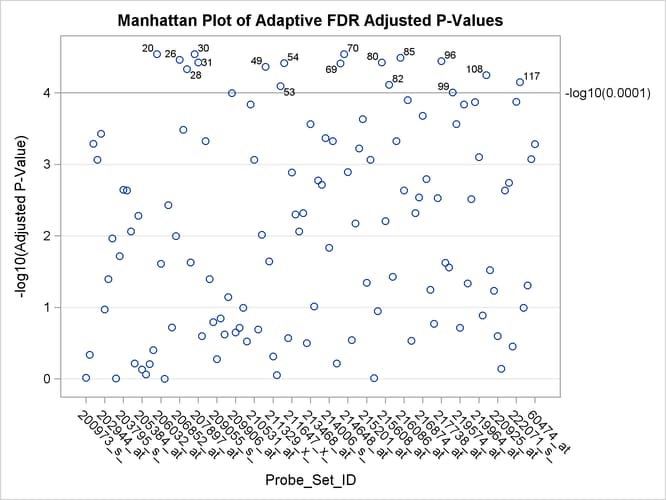 The following statements create a Manhattan plot of the adaptive FDR p-values, with the most significant tests labeled with their observation number. The ID values are displayed on the X axis, and the VREF= option specifies the significance level. This plot is typically created with many more p-values, and special ODS Graphics options such as the LABELMAX= option might be required to display the graph. If memory usage is an issue, you might want to store your p-values and use the SGPLOT procedure to create a similar graph.